It's been four amazing years since BensCustomCases changed up the focus, switched domain names and became BCCHardware. Since then we've published 400 reviews, various other articles and daily tech news. We have over 6,500 news posts and built a community forum that enables you to leave feedback and ask questions regarding tech, gaming, news and life. We've also been to CES for 2 years and are about to head off for our third trip - CES 2009. To celebrate these milestones, we've put up a new logo and more importantly, have a few things to give away as we count down to CES 2009. Contest Ends when we've given away all of our prizes. Winners will be announced shortly thereafter. All prizes will ship anywhere in Canada or the United States for Free. At the end of each day, a name will be drawn and a prize given to the winner. Each days giveaway will be drawn at 11:59PM MST. The winner will be notified and the prize will be shipped once the winner has claimed his/her prize. Jan. 3 Prize - NZXT Avatar Gaming Mouse - Claimed!!! Jan. 4 Prize - iStarUSA T5F-SS 5.25in Trayless SATA/SAS Rack - Claimed!!! Jan. 5 Prize - NZXT Cryo LX Notebook Cooler - Claimed!!! 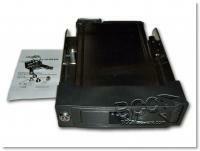 Jan. 6 Prize - VIZO Ares II Dual 2.5in SATA Drive Rack - Claimed!!! Jan. 7 Prize - NZXT Sentry LX Aluminum Fan Controller - Claimed!! !